PHYSICAL DESCRIPTION: A slightly younger version of Reggie Bushroot, pre-mutation, with a full head of brown, bushy hair. 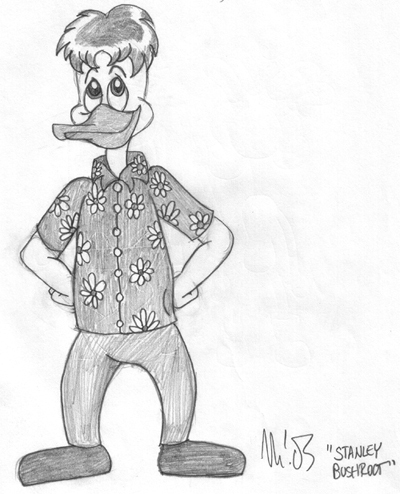 CLOTHING: A red Hawaiian shirt printed with daisies, blue jeans, sneakers. His style is somewhat bold, but casual and comfortable. OCCUPATION: One of Saint Canard's best florists. HOBBIES: Gardening, cooking, darts, pinochle, and sketching still-lifes of flowers. SPECIAL ABILITIES: Advanced knowledge of flowering plants. Remarkable floral arrangement skills; specializes in wedding bouquets. Expert banjo player. Outstanding cook, particularly with vegetable dishes. Dart practice has also made him an expert marksman. ORIGIN: Stanley is Reginald Bushroot's younger brother by five years. From his diaper days and onward, Stanley was confident and assertive, but not particularly popular. He was the token oddball at school, albeit a perfectly affable one. His creative and fun-loving outlook on life often surprised and charmed those around him, but his most peculiar trait was his love of plants. He often sketched them, photographed them, and read about them. In high school, Stanley earned his fame through selling homemade corsages around prom time. When he was comissioned to design a corsage for the school bully's girlfriend, she was so impressed by Stanley's workmanship that she asked him out to the prom instead. Her boyfriend was not happy-- to say the least-- and nearly killed Stanley. This experience scared him so much that he dropped out of school, moved across the city into his own house, and got a job at a flower shop. As the years went by, the shop eventually became his. Stanley currently enjoys a modest living, though he has not heard from Reggie for years and misses him very much. What Stanley does not know is that Reggie blames himself for what happened to him. PROBLEM-SOLVING: While Stanley's usually laid-back, confrontations of any kind make him nervous. He hides this under an aggressive front, and he usually handles himself well since he has a sharp mind. But too much pressure will eventually break him down, especially when he's in danger. When that happens, he becomes completely helpless. MOTIVATION: To lead the most pleasant, happy, and enjoyable life as possible, with little to no bumps along the way. He'll also do anything to help his friends and family purely out of love and loyalty. PERSONALITY: Stanley is the kind of guy who'd love to be your friend, and even if you don't want to be his, he'll understand, and he'll still like you. If you are his friend, he'll be super-loyal and will always stand up for you, even when you make a mistake. If you get on his bad side-- a difficult thing to do--, he'll be very cold and unforgiving, though not cruel.